CANBERRA, Australia — Australia's government said Tuesday it has turned a corner on mounting debt, proposing a plan to give tax cuts to most Australians while balancing the books within two years. 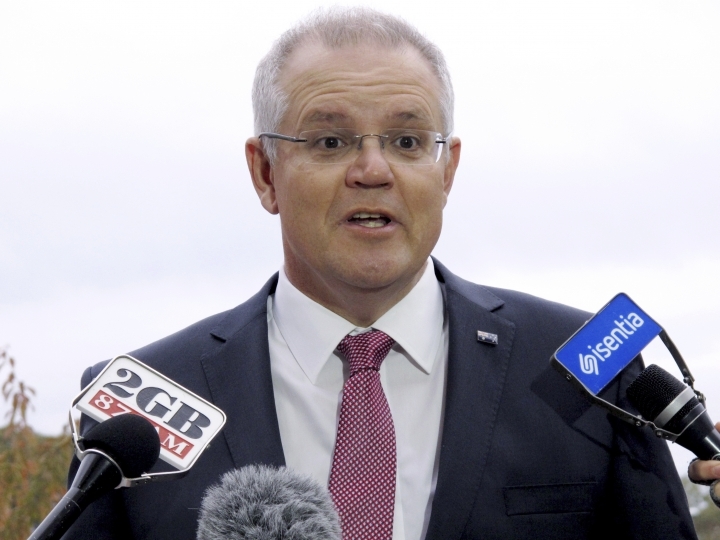 Treasurer Scott Morrison revealed to Parliament on Tuesday his third annual budget and his last before his conservative coalition stands for re-election within a year. He promised a modest surplus of 2.2 billion Australian dollars ($1.65 billion) in the 2019-20 fiscal year— down from an estimated AU$18.2 billion deficit in the current year ending June 30. The return to surplus had been expected a year later. Australia recorded a decade of surplus budgets before the global financial crisis in 2008. It has accumulated deficits every year since. "The Australia economy is now pulling out of one of the toughest periods we have faced in generations," Morrison told Parliament. "As a result of this fiscal discipline, the government has turned the corner on net debt," he said in a budget document. Prime Minister Malcolm Turnbull has said he will call an election early next year. But he could be tempted to call an early election if the budget is well received and his conservative coalition's standing in opinion polls improves. The government consistently trails the center-left opposition Labor Party in polling. The budget measures will need the support of a hostile Senate to take effect. The budget calls for net debt — the sum of financial liabilities less assets — to peak in the current year at 18.6 percent of GDP, or AU$341 billion. That's a year earlier than Morrison forecast in his last budget. Gross debt, the value of government securities, was expected to peak next year at 29.4 percent of GDP — AU$561 billion ($421 billion) — then fall to AU$532 ($399 billion) a decade later. A mining boom driven by Chinese demand that kept Australia out of recession during the crisis has gone, although prices for Australian iron ore and coal have recently rebounded. The AU$1.8 trillion ($1.4 trillion) Australian economy is expected to grow by 2.75 percent in the current fiscal year then 3 percent annually for the next two years. Unemployment is expected to fall from 5.5 percent this year to 5.25 percent for the next three years. "There has been an upswing in trade globally, especially in our Asian neighbors," a budget document said. "Australia's strong links with the Asian region continue to present opportunities for our businesses to export, with our trading partner growth expected to exceed global growth over the next few years," it added. Total government revenue for the next fiscal year is expected to be AU$486.1 billion ($365 billion), up 6.6 percent from the current year. Government expenses next year were expected to fall 4.2 percent from the current year to AU$488.6 billion ($367 billion). Some critics argue the government should be more aggressive in cutting expenditure and retiring debt. But the government proposes tax cuts for lower and middle income earners of up to AU$530 ($400) a year at a cost to the budget of AU$140 billion ($105 billion) over a decade. Morrison said the tax cuts showed he respected taxpayers. 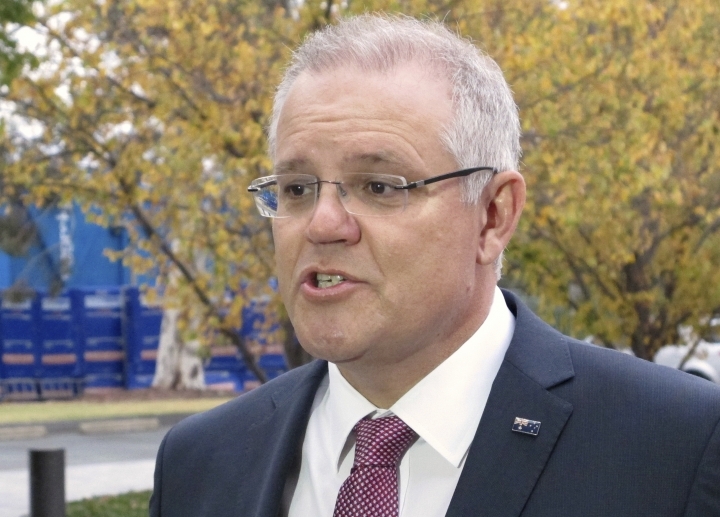 "When too much tax revenue is coming in because the tax system is actually overburdening them, I think it's wrong to punish them for that," Morrison told reporters. The government plans to spend more the AU$75 billion ($56 billion) on infrastructure projects including road and rail in this decade. The government announced on Tuesday plans to spend AU$536 million ($402 million) over five years on rescue plan for the Great Barrier Reef. It includes programs to reduce fertilizer runoff from farming, remove destructive crown-of-thorns starfish and fund research into coral bleaching. Environmentalists argue that the funding won't tackle the main threat to the reef: global warming. They are calling for more aggressive action to reduce Australia's greenhouse gas emissions. The government also announced plans to spend AU$1.3 billion ($970 million) over a decade to help Australia become a global health industry leader in medical technology and pharmaceuticals.